Gillian Flynn has 1 media appearance. Told from the alternating perspectives of Amy and Nick whose marriage is falling apart in small-town Missouri, this is first a story of perfect young love in Manhattan, followed by its slow disintegration after both partners lose their jobs and move to Nick's hometown to help his family through his mother's terminal illness. Join the BookEnds BookGroup for this month's selected reading. Gone Girl By Gillian Flynn Marriage can be a real killer. One of the most critically acclaimed suspense writers of our time, New York Times bestseller Gillian Flynn takes that statement to its darkest place in this unputdownable masterpiece about a marriage gone terribly, terribly wrong. The Chicago Tribune proclaimed that her work “draws you in and keeps you reading with the force of a pure but nasty addiction.” Gone Girl’s toxic mix of sharp-edged wit and deliciously chilling prose creates a nerve-fraying thriller that confounds you at every turn. On a warm summer morning in North Carthage, Missouri, it is Nick and Amy Dunne’s fifth wedding anniversary. Presents are being wrapped and reservations are being made when Nick’s clever and beautiful wife disappears from their rented McMansion on the Mississippi River. Husband-of-the-Year Nick isn’t doing himself any favors with cringe-worthy daydreams about the slope and shape of his wife’s head, but passages from Amy's diary reveal the alpha-girl perfectionist could have put anyone dangerously on edge. Under mounting pressure from the police and the media—as well as Amy’s fiercely doting parents—the town golden boy parades an endless series of lies, deceits, and inappropriate behavior. Nick is oddly evasive, and he’s definitely bitter—but is he really a killer? As the cops close in, every couple in town is soon wondering how well they know the one that they love. With his twin sister, Margo, at his side, Nick stands by his innocence. Trouble is, if Nick didn’t do it, where is that beautiful wife? And what was in that silvery gift box hidden in the back of her bedroom closet? With her razor-sharp writing and trademark psychological insight, Gillian Flynn delivers a fast-paced, devilishly dark, and ingeniously plotted thriller that confirms her status as one of the hottest writers around. BookEnds BookGroup usually meets every last Sunday of the month at 3 pm in The Gallery. BookGroup reads are 20% off prior to the event to BookGroup participants. Always free and all are always welcome. The Old St. Pat's Book Group meets at 7 PM to discuss Gone Girl By Gillian Flynn. Diesel, A Bookstore in Malibu welcomes the Malibu Book Club back to the store to discuss Gillian Flynn's novel, Gone Girl, on Wednesday, June 12th at 5pm.Marriage can be a real killer. One of the most critically acclaimed suspense writers of our time, New York Times bestseller Gillian Flynn takes that statement to its darkest place in this page-turning masterpiece about a marriage gone terribly, terribly wrong. The Chicago Tribune proclaimed that her work "draws you in and keeps you reading with the force of a pure but nasty addiction." Gone Girl's toxic mix of sharp-edged wit and deliciously chilling prose creates a nerve-fraying thriller that confounds you at every turn. The author of the #1 New York Times bestseller Gone Girl, which is the Winnetka-Northfield Public Library’s current “One Book Two Villages” selection, talks about her writing and the amazing success of her novels. To sign up (6 pm Cocktail Party + Lecture, $30; 7:30 pm, Lecture only, $10), go to http://obtv13.eventbrite.com. Gillian Flynn's book The Mystery Writers of America Cookbook was available from LibraryThing Early Reviewers. 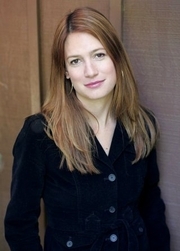 Gillian Flynn is currently considered a "single author." If one or more works are by a distinct, homonymous authors, go ahead and split the author. Gillian Flynn is composed of 3 names. You can examine and separate out names.